In the Name field, type the name of your server (for example, My Origin Server). This name is displayed in the Fastly web interface. In the Address field, type the IP address (or hostname) for your website's origin server. See Understanding the difference between certificate hostname and SNI hostname values for more information about hostnames. Leave the Enable TLS? default set to Yes if you want to enable TLS to secure the connection between Fastly and your origin. To enable TLS, a valid SSL certificate must be installed on your origin server and port 443 (or the specified port) must be open in the firewall. You can select No if you do not want to use TLS. In the Certificate hostname field, type the hostname associated with your TLS certificate. This value is matched against the certificate common name (CN) or a subject alternate name (SAN) depending on the certificate you were issued. If you are specifying an SNI hostname, see the section below. 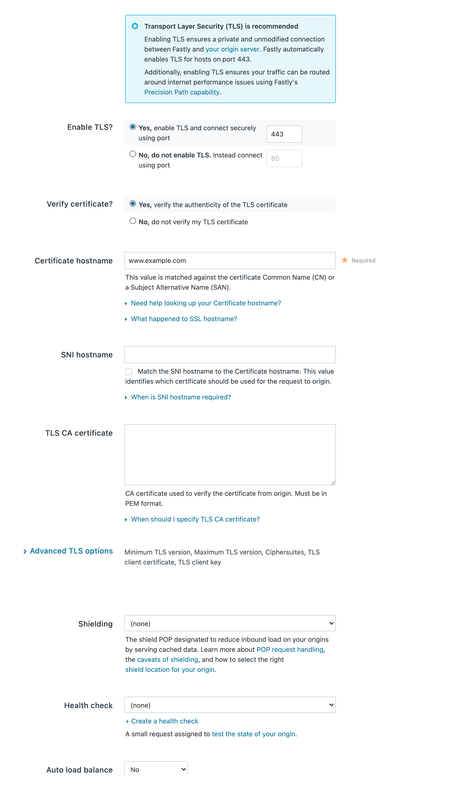 If you are specifying a TLS CA certificate, see the section below. From the Shielding menu, optionally select a POP to enable the shielding feature. For more information, see our guide on shielding. From the Health check menu, optionally select a health check for this origin server. For more information, see our guide on working with health checks. From the Auto load balance menu, optionally select Yes to enable load balancing for this origin server. For more information, see our guide on load balancing. If you enabled load balancing, type a weight in the Weight field. And that's all you need to do. Everything else is optional, but just in case you'd like to set them, we've included the information below. Normally we check the server certificate against the hostname portion of the address for your origin entered in the Create a host window. Checking the certificate is done by using the value of the Certificate Hostname field in your origin TLS settings. To have Fastly verify the certificate using a different hostname, specify it via the SNI Hostname field under Advanced options. This information also gets sent to the server in the TLS handshake. If you are using Server Name Indication (SNI) to put multiple certificates on your origin, specifying it in the SNI Hostname field will select which one is used. The certificate hostname (ssl_cert_hostname). This hostname validates the certificate at origin. This value should match the certificate common name (CN) or an available subject alternate name (SAN). It displays as ssl_cert_hostname in VCL. This doesn't affect the SNI certification. You can set this value in Certificate hostname field of the TLS options page. The SNI hostname (ssl_sni_hostname). This hostname determines which certificate should be used for the TLS handshake. SNI is generally only required when your origin is using shared hosting, such as Amazon S3, or when you use multiple certificates at your origin. 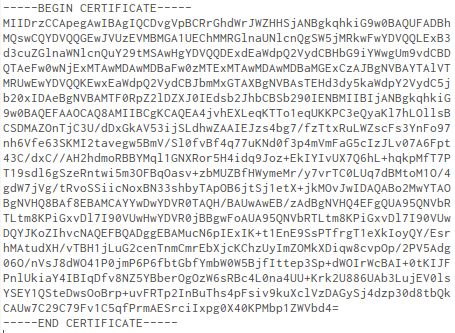 SNI allows the origin server to know which certificate to use for the connection. This value displays as ssl_sni_hostname in VCL. This doesn't affect the certificate validation. If you don't enter an actual value in your certificate hostname, the .host value is used by default to verify the certificate. The .host value is the actual IP address or virtual hostname you enter in the Address field on the Host area of the Origins page. This value is matched against the certificate common name (CN) or a subject alternate name (SAN). About the ssl_hostname value (deprecated). The ssl_hostname value has been deprecated and replaced with ssl_cert_hostname and ssl_sni_hostname. Use these two values instead. IMPORTANT: If you use an IP address for your .host value (i.e., by not entering a value in your certificate hostname), this will generate an error where the certificate hostname specified in your service's origin TLS settings doesn't match either the Common Name (CN) or available Subject Alternate Names (SANs). If you set the certificate hostname to *.example.com, Fastly will treat it as a literal. When using that as the certificate hostname, *.example.com is the only option for the SNI hostname. To ensure TLS connections to your origin come from Fastly and aren't random, anonymous requests, set your origin to verify the client using a client certificate. Simply paste the certificate and private key in PEM form into the appropriate text boxes on the TLS options page. IMPORTANT: The private key must not be encrypted with a passphrase. If your origin server is configured with support for modern TLS protocol versions, you can customize the TLS protocols Fastly will use to connect to it by setting a Minimum TLS Version and Maximum TLS Version under Advanced options. We recommend setting both to the most up-to-date TLS protocol, currently 1.2, if your origin can support it. Replace -tls1_2 with tls1_1 and tls1_0 to test other protocol versions. Fastly does not support SSLv2 or SSLv3. IMPORTANT: In line with security best practices, Fastly recommends enabling servers with version 1.2 of the TLS protocol by default. For backend connections from our edge nodes to customer origins, Fastly supports TLS 1.2, 1.1, and 1.0 depending on the versions of the protocol in use on the origin server. Fastly will continue to support TLS 1.0 based on the ServerHello message as described in RFC 5246 if the server selects TLS 1.0 as the highest supported version. Fastly supports configuring the OpenSSL cipher suites used when connecting to your origin server. This allows you to turn specific cipher suites on or off based on security properties and origin server support. The Ciphersuites setting under Advanced options accepts an OpenSSL formatted cipher list. We recommend using the strongest cipher suite your origin will support as detailed by the Mozilla SSL Configuration Generator. Replace -cipher ECDHE-RSA-AES128-GCM-SHA256 with the cipher suite to test.